Monday, Feb. 12th, is the beginning of the filing period for candidates for public office in North Carolina. Technically, that’s when Democrats and Republicans, hoping to compete in their respective party primaries for a chance to be ultimately selected to run in the fall 2018 midterm elections, commit themselves for either statewide or congressional office. But thanks to an unceasing plethora of court cases involving legislative, congressional and judicial redistricting, confusion has been the buzzword as to whether even the filing period would be allowed to commence. At press time Tuesday, there was no official word of any delays that would disrupt the filing period. In fact, at least one court ruling last week cleared the way for several judicial candidates who originally were off the ballot. U.S. District Court Judge Catherine Eagles partially granted a preliminary injunction against Senate Bill 656, which, when passed by the Republican-led NC General Assembly last year, eliminated judicial primary races. In her order, Judge Eagles said it made no sense to do away with primaries for statewide races for the state Court of Appeals and the NC Supreme Court (currently there are races for both) because neither post are depended on voting districts. However, because district and superior court cases do involve voting districts, and the legislature is currently considering a new judicial redistricting map (expected to be debated and voted on this week, according to reports) Judge Eagles decided to allow the elimination of primaries in those races, until she can decide whether the law was completely unconstitutional. Meanwhile, in the legislative redistricting case where a federal three-judge panel ruled that the maps drawn by a court-appointed special master should be used to correct the racially gerrymandered voting districts drawn by GOP lawmakers, the U.S. Supreme Court Tuesday temporarily blocked a special master’s maps for Wake and Mecklenburg counties, while allowing maps for six other redrawn counties to stand. Republican legislative leaders petitioned for an emergency stay, as well as a notice of appeal. It is not known why the Wake and Mecklenburg county maps were blocked. In all, there are five redistricting cases pending in the both federal and state courts in North Carolina, and most observers expect that because these cases deal with how voting districts are drawn, while the filing for office may not be delayed, the May primaries may be for at least a month. During his speech in Cincinnati Monday, Pres. 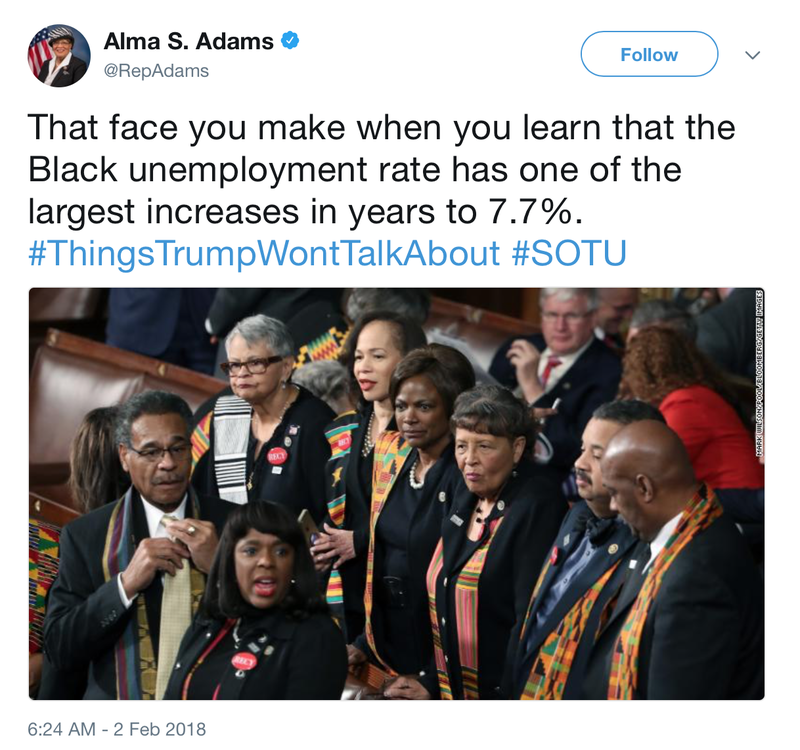 Donald Trump attacked members of the Congressional Black Caucus who, while Republicans were loudly applauding, refused to clap while African kente’ cloth draped their all-black attire, or acknowledge the president’s announcement that black unemployment had dropped to an historic 45-year low during his first State of the Union address to Congress and the nation. Even before the Republican president accused them of “treason” for not applauding him, two prominent members of the CBC – Rep. Alma Adams (D-NC-12) and Rep. G.K. Butterfield (D-NC-1) – had pretty much had their fill of Trump, especially after his infamous “s---hole” reference to Haiti and Africa. So his subsequent taking credit for black unemployment going down to just single digits for the first time in a long time, didn’t help. When asked about the decline in black unemployment (which was 6.8, a fall from a high of over 15.2 years earlier), Butterfield echoed his North Carolina colleague’s sentiment. “He inherited a Trillion-and-a-half dollar deficit. So for eight years, he very painfully, tried to get the unemployment rate down…so what Donald trump is experiencing now is simply a continuation of a trend that began during the Obama years,” Congressman Butterfield continued. Butterfield went on to say that that black unemployment was 6.8 percent, but the overall jobless rate was 4.1 percent, meaning it was still high compared to the national average. That was Tuesday, Jan. 30th, the night of Pres. Trump’s SOTU. Three days later, black unemployment was reported at 7.7 percent, up almost a full point. 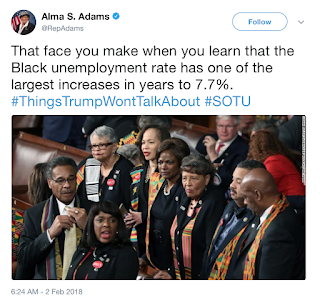 Tweeting a frowning face she had during the SOTU, Congresswoman Adams wrote, “That face you make when you learn that the Black unemployment rate has one of the largest increases in years to 7.7%. [RALEIGH] All roads lead to Raleigh Saturday for the 12th Annual Moral March on Raleigh & Historic Thousands on Jones Street People’ Assembly, sponsored by the NC NAACP, it’s 125 local branches, and it’s over 200 social justice coalition partners. This year’s theme is “Taking the Resistance Straight to the Ballot Box,” and thousands of demonstrators from across the state are expected to converge on downtown Raleigh early Saturday morning at 8:30 am for the pre-rally which begins at 9 am at the corner of Wilmington and South Streets near Shaw University. At 10 am, the march/people’s Assembly begins to the state Capitol. For more information, go to naacpnc.org, or hkonj.com. [RALEIGH] The official national kickoff of the 2018 Poor People’s Campaign isn’t supposed to begin until May, but last Tuesday, 30 cities across the nation, including here in Raleigh, started pre-kickoff marches with small, but determined groups of protesters. At least 30 gathered on the Halifax Mall across from the NC legislature, and rallied to demand that state and federal governments do much more to help the poor. Then they marched over to the Legislative Building, and delivered letters to the offices of Republican leaders Senate President Phil Berger, and House Speaker Tim Moore. The leaders of the national Poor People’s Campaign are Bishop William Barber, former president of the NC NAACP, and Rev. Liz Theoharis. [RALEIGH] Touring the nation, gathering testimony and evidence pertaining to the status of voting rights, the US Commission on Civil Rights came to Raleigh Feb. 2nd, hearing testimony, and allowing the public to speak to the issue. Throughout the daylong session, various panelists told the commission about why North Carolina is considered Ground Zero in the national battle over voter redistricting and voting rights. The state has repeatedly been chastised by state, federal courts, and even the US Supreme Court, for implementing unconstitutional laws and redistricting maps to gain partisan advantage come election time. The commission is expected to use the information gathered for an ongoing assessment of federal enforcement of the 1965 Voting Rights Act.